In 1893, a single tree was found growing along a fence row on the farm of Ben Frost in Durham, Arkansas. 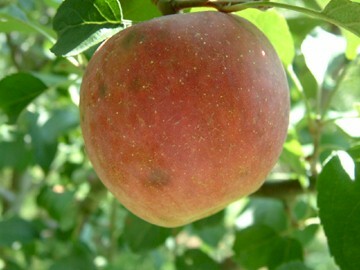 Thought to be a cross of Jonathan x Winesap or Jonathan x Arkansas Black, it was bought and trademarked by Stark Bro’s Nursery in 1902 and sold to commercial growers as a substitute for Jonathan. 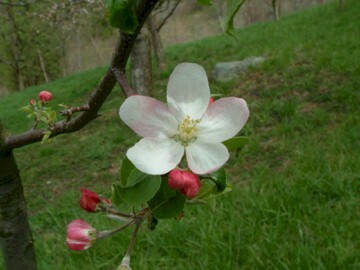 The fruit is good for fresh eating, cooking, and cider making. The tree is a late bloomer and quite disease resistant. Fruit is medium to large, rounded and often ribbed at the stem end. The skin is pale green overlaid with deep red and dark red stripes and is sometimes greasy to the touch. The firm yellow flesh is crisp, firm and juicy. Ripens October to December.